Parade floats 1/2/10 A comment about this post mentioned the "Dirty Jobs" episode in which Mike Rowe helps dismantle parade floats. You can see a clip here at the 2-minute mark. Marijuana and embalming fluid 12/28/09 Gamblers in South Africa are driving vultures to extinction because they believe that inhaling the smoke of the bird's brain confers the gift of premonition. Bushmeat 12/27/09 National Geographic reports that many "zoos" in China are illegal fronts for the raising of tigers for their meat. A Christmas Carol 12/24/09 A Turkish archaeologist is seeking the return of the relics of St. Nicholas (270-346) from Italy. Happy Thanksgiving! 11/26/09 I decided against doing a post on artist Méret Oppenheim (1913-1985), but see 2 more of her great Surrealist works here (scroll down to the 2nd image) and here. Stone/house 11/19/09 I just learned about the work of Mexican architect Javier Senosian, whose houses have a very organic style. Taxidermy furniture 11/!6/09 A patron of a New York City restaurant has sued the owner for negligence after a 150lb moose head with antlers 3' wide fell off the wall and gave her a concussion. Meanwhile, in Florida, someone has combined an alligator and a motorcycle. Here is an article about taxidermy as a decor trend, and another artist using dead animals in her work. Lastly, check out the shoes here and here from the Virtual Shoe Museum! World's heaviest insects 8/28/09 Owners of tarantulas are warned to protect their eyes after a man in Leeds, England, suffered spider hairs in his cornea when cleaning the cage. 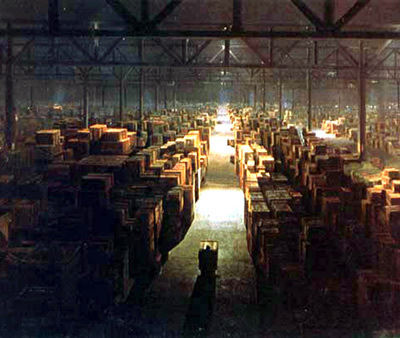 Museum behind the scenes 7/25/09 The failure of the U.S. Department of the Interior to properly curate the objects under their stewardship conjures up images of the final scene in Raiders of the Lost Ark. Birthing and hoarding bunnies 6/18/09 More than 500 animals - most of them dead, including deer, cobras, and monkeys - were found in and around a home in Feltonville, Pennsylvania; they were collected not by a hoarder, but by practitioners of animal sacrifice. "Seven Pounds" 6/14/09 The winner of a contest to have the "Best Job in the World" was stung by the extremely venomous Irukandjii jellyfish on the beach of his temporary home on Australia's Hamilton Island. 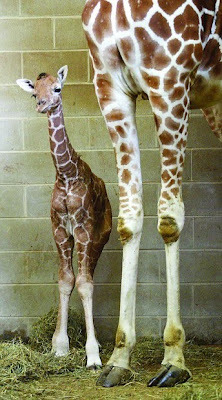 Giraffe evolution 5/15/09 A baby giraffe (pictured above) has been born - weighing 150lbs, standing 6' tall, and standing within an hour of birth - at the Niabi Zoo in Coal Valley, Illinois. Mastectomy tattoos 4/27/09 After years of associating Susan G. Komen (1943-1980) with breast cancer, I wondered who she was. Double-muscled dog 1/30/09 The tongue of a dog in Paisley, Scotland, swelled to 4 times normal after some pork membrane cut off the blood supply at its base.